Trump declared his intension to recognise the sovereignty of Israel over the Golan Heights, which has both external and internal political dimensions. On April 9, Israel is going to hold parliamentary elections, and the decision of the US President is the most powerful PR move in support of the Netanyahu campaign. In order to preclude any suspicions that this statement may have been a capricious message from the eccentric president, rather than a conscious White House decision, it was made during the visit of US Secretary of State Mike Pompeo to Israel. Echoing his superior’s point on the “extraordinary strategic importance of the Golan Heights”, Mike Pompeo said that Washington’s move is not an indication of US double standards regarding Crimea: “What the president did with the Golan Heights is recognise the reality on the ground and the security situation necessary for the protection of the Israeli state. It's that – it’s that simple.” According to the American diplomat, this decision does not violate any resolutions made by the UN Security Council. On the contrary, “the decision the president made will increase the opportunity for there to be stability throughout the region”. Such an argument will hardly convince anyone, either within the US or in the international community. For instance, Germany, Great Britain, Russia, and the Arab world, each for its own reasons, still hold the position that the Golan Heights is Syrian territory, occupied by Israel. For Trump himself, this decision does not imply any risk: Israel’s enemies will not change their attitude towards the Jewish state regardless of Washington's perception of the formal status of the Golan Heights. The Arab Street will calm down after a brief boiling over. Arab leaders will tolerate this decision, just as they tolerated the US’s recognition of Jerusalem as the capital of Israel in December 2017. Europeans will not go beyond words in finding fault with this crisis in “Atlantic solidarity”. There are three significant questions that need to be answered. First, how much violence will Trump’s announcement provoke? Second, how will this decision affect Palestinians everyday lives, and third, will this matter at all for the prospects of a peace deal between Israel and the Palestinians? The various coalitions in the Democratic Party are indeed unanimous in their rejection of Trump’s decision, but in recent months, the party itself indicated that it is seriously split over the Israel issue. Some of the Democrats who were elected to Congress in November 2018 (the “progressive wing”), promote an extremely critical position regarding the Jewish state and US support of Israel. A number of their senior party colleagues from the 'left wing' and American Jewish liberals support their position. Such trends are gradually eroding the traditional interparty consensus of American politics toward Israel-related issues. Golan Heights: Where Are the Red Lines? 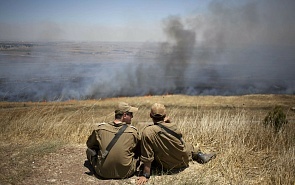 The Golan Heights represent an equal problem for Syria and Israel. During the reign of both Hafez and Bashar Asad, this border was quite quiet (approximately from 1973-1974 till 2015). Although the peace treaty between Syria and Israel was not achieved despite the various attempts and mediation of different persons and states, there were no military actions and real threats from the Syrian side. This situation suited Israel, but not Syria, since most of the Golan Heights are controlled by Israel.